Paul Tremblay's Disappearance At Devil's Rock was one of my favourite books of 2016 so I was looking forward to A Head Full Of Ghosts. Like Disappearance At Devil's Rock it's a well-written, ambiguous horror novel that's as much about a family in crisis as it is about the sinister tale that forms the main plot. The story focuses on two sisters, eight-year-old Merry and her teenage sister Marjorie. One day, Marjorie starts to behave strangely. The stories she used to make up to entertain her little sister take a sinister turn. She makes terrifying threats. She hears voices. She self-harms, vomits spontaneously and loses all sense of inhibition. At first, her parents take Marjorie to see a psychiatrist, but eventually, her father decides it's time for a priest, and almost before Merry understands what's happening, the Barrett family is the subject of The Possession, a reality TV documentary about Marjorie's plight. All the classic hallmarks of a story of possession are there in this book - acknowledged in a series of chapters that take the form of an analysis of The Possession by a horror blogger - but this is much more than a straightforward horror novel. It's certainly frightening, and perfectly captures the strong sense of unease and then outright terror that Merry feels as her sister's personality changes. But it's also a portrait of a struggling family gradually breaking down. John Barrett is unemployed and relying on his wife's salary; his sudden commitment to Catholicism begins with his insistence on saying grace before meals when the family are running out of money to put food on the table. Is Marjorie really possessed? Is she faking, for the lucrative TV deal? Or is she simply desperately ill and being failed at best and exploited at worst by the people around her? 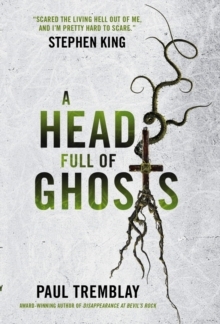 I found A Head Full Of Ghosts to be an unsettling read that discomfits the reader more and more as the story unfolds, especially when we start to realise that Merry, telling her story as an adult from the point of view of her hyperactive, happy-go-lucky eight-year-old self, is perhaps not quite as reliable a narrator as we are at first inclined to believe. There is certainly horror to be had - but where, exactly, that horror lies is certainly debatable. As with Disappearance At Devil's Rock, (and, in my view, all the best supernatural fiction) there are numerous possibilities, but each of them is equally unnerving. This is a chilling but thoughtfully-written read that has echoes of Shirley Jackson's We Have Always Lived In The Castle. Paul Tremblay is one of the best American writers of supernatural fiction I've read in a long time, and I look forward to more books from him.